Abstract Jewelry - This is a handcrafted artistic sterling silver pendant that features three freshwater cultured white pearls - two round pearls (7mm each) and one coin pearl (11mm). This interesting statement necklace comes with an 18" snake chain. 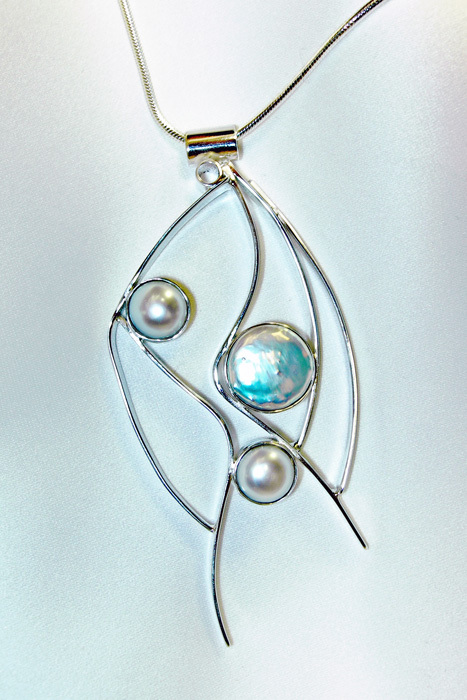 A Sterling Silver modern pendant with Three fresh water cultured pearls. The large pearl is approximately 11 mm in diameter and the small pearls are approximately 7 mm in diameter each. The pendant is shown with an 18" long Sterling Silver wheat chain, but a snake chain is available. Designed and signed by Aaron Rubinstein and handmade by Modern Art Jewelry.